The Committee to Protect Oil-Gas- Mineral Resources in Bangladesh, The UK Branch invites everyone to join a public meeting with a distinguished economist and environmentalist Professor Anu Muhammad, who comes to London from Bangladesh to meet the activists in London this Sunday. When: Sunday the 28th September, at 5 pm. Where: Montefiore Centre, Hanbury Street, E1 5HZ , London. Key note speaker: Professor Anu Muhammad, a distinguished Economist and the Member Secretary of the National Committee to Protect Oil Gas and Natural Resources in Bangladesh. Multinational corporation such as the UK’s Global Coal Management Resources Plc (GCM), is aggressively moving to undermine Bangladesh through plundering its energy sector and damaging the environment. Through implementing a massive open pit coal mine in the north-west of Bangladesh, the government-backed British company, the GCM, wants to bring in devastating impact on Bangladesh’s environment and human rights. The proposed Phulbari project alone would displace 200,000 people, destroy over 14,660 acres of fertile agricultural land, obliterate water sources of 220,000 people, and lower the ground water by 15-20 meter in the region. It will also damage social and ecological spheres, pollutants will contaminate water bodies, rivers and the entire lower riparian. Bangladesh will get 6% loyalty and 94% revenue will be taken by GCM! While the communities in the north-west region in Bangladesh is powerfully resisting the proposed coal-mine project, the governments in Bangladesh and UK remain silent – encouraging the devastation to go ahead and allowing also to set up a coal fired power plant which would affect the Sundarbans, the world’s largest mangrove forest. The proposed 1320 MW Rampal coal fired power plant is an India-Bangladesh joint venture. Sundarbans is under threat as Rampal power plant will emit huge carbon, toxic gases, smoke and ash which will have devastating environmental impact and may destroy the forest as the project area lies only 10 KM away from the forest. In addition, the Government, encouraged by the corporations, are adding on another power plant proposed by Bangladeshi Business Group, Orion, to set up very close to the vicinity of the Sundarbans. Sunday’s public meeting has been organised to address these issues and to find ways to abolish those harmful and devastating interferences of multinational corporations in Bangladesh. A devastating gas explosion occurred on 14 June 1997 while oil and gas company Occidental was drilling at Magurchara, northeast Moulovibazar district in Bangladesh. The explosion destroyed about 700 acres of reserved forest and 10 tea gardens, damaged environment, ecology and wildlife around. It is estimated that 250 billion cft gas was destroyed in this accident and its value stands nearly $2.5 billion, which must be recognised by the responsible company. They are yet to acknowledge their responsibilities. 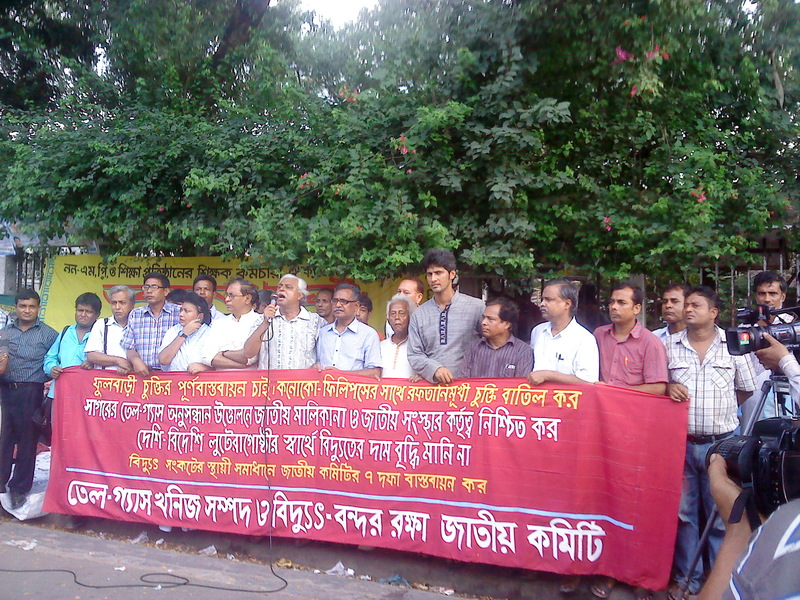 Rather, the world’s multinational corporations are moving aggressively to destroy Bangladesh. Chevron Bangladesh is asking for tariff hike for offshore oil and gas exploration. ConcoPhillips, an American multinational energy corporation, has also demanded offshore gas exploration contact for 80% of loyalty and export facility. All of these companies make Bangladesh as an object of lottery and a source of their fortune by exploitation and corruption. These evil deals and production share contract (PSC) are working against Bangladesh’s interest. Instead of fixing irregularities and corruption, the government is expanding the authority of local and foreign companies to control energy and power sector, causing more drainage of public money and vulnerability of the country. We can’t allow plundering and destruction of Bangladesh in such a way. We call for global support to stop the deleterious power plant and open pit coal projects. We need your support and solidarity to strengthen local and global fight against corporate plundering. Professor Anu Muhammad, a distinguished economist from Bangladesh and a key activist against corporate plundering of energy resources in Bangladesh, will be addressing these and related issues. A public meeting will be held on this Sunday, the 28th September, 2014 at 5pm at Montefiore Centre, Hanbury Street, E1 5HZ , London. This is an opportunity to hear from Anu Mohammad. He has been fighting against open pit coal mine in Phulbari and Rampal coal based power plant for protecting world largest mangrove forest Sudarban and playing a pioneering role to defend oil gas, natural resources, environment and ecology in Bangladesh. Phulbari Solidarity Group expresses their full solidarity with the aim of the public meeting organised by the UK Committee to Protect Oil, Gas and Natural Resources in Bangladesh. With solidarity to struggle and resistance we invite everybody to come and share our struggle for equality and social justice. Come and join us along with friends! Feel free to share this invite to all who may support our cause! Do not let the government-backed corporations to undermine human rights, plunder our resources or damage environment! This entry was posted in Global Coal Management, National Committee of Bangladesh, National Contact Point UK, Phulbari. Bookmark the permalink.